When we think of ‘bling’ a few things come to mind – music videos, red carpets, and exclusive events. But iced-out watches aren’t just for the famous. Effortlessly cool, these luxury watches will elevate any look, catch every glimmer of light, and undoubtedly steal the show. Here, we’re highlighting a handful of icy watches that the everyday man (or woman) can sport. 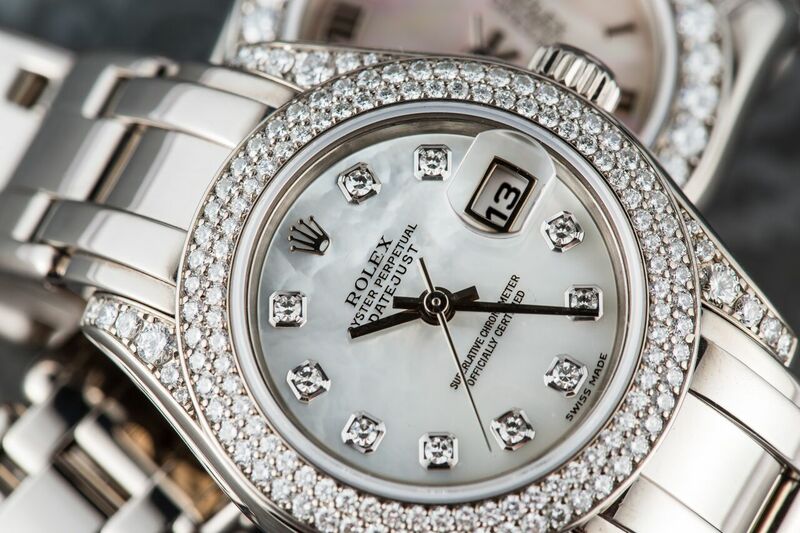 The Pearlmaster is Rolex’s collection of ultra-premium icy watches that blur the lines between wristwatches and jewelry. 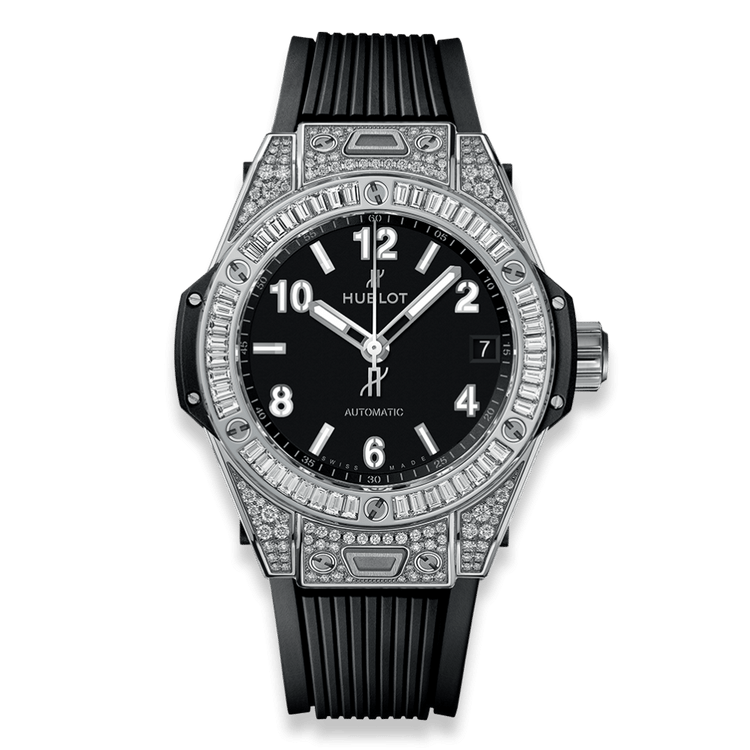 A simple black rubber strap helps keep this diamond-encrusted watch a piece that can exist outside the world of professional sports and red carpets events (Image: Hublot). This watch might look like the type of timepiece your favorite sports star flashes after the game, but you too can get your hands on this icy timepiece for a cool $48,000. The 39mm stainless steel case is outfitted with a whopping 118 diamonds – the bezel paved with another 48 baguette-cut diamonds. Then, to balance out the bling, Hublot has toned it down with a simple black rubber strap. While this watch is studded with nearly two-hundred diamonds, it still manages to feel relatively approachable. Maybe it’s the black face with those familiar bold numerals, or the industrial screws perfectly placed between the diamonds. Either way, I’m sold. You might not play professional sports, but this watch is going to look just as good on your wrist after a pickup game. Oh, and if you’re interested at all in what’s under the sapphire crystal, ticking inside is a beautiful self-winding HUB1710 calibre with a 50-hour power reserve. 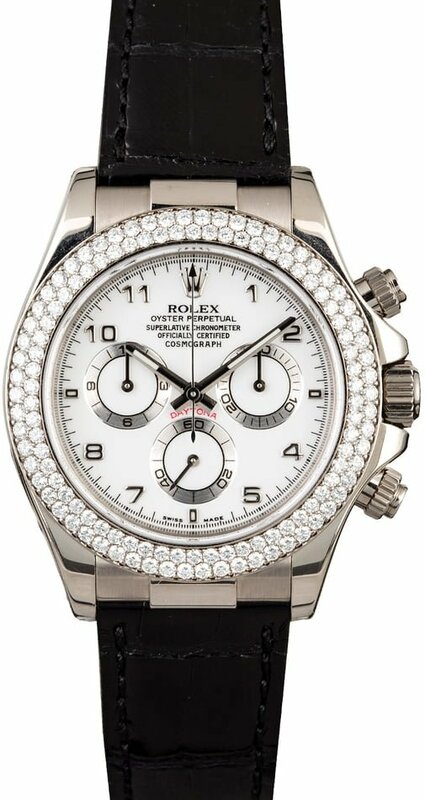 Despite having a tool-watch heritage, this Rolex Daytona sports a white gold case and diamond-set bezel. Slip on a Rolex Daytona and it’s a sure sign you’ve ‘made it.’ This iconic watch screams luxury and oozes with vintage heritage; but, you definitely don’t have to be in the ranks of Paul Newman to sport one. Personally, I love how this already in-your-face watch has been blinged out with two rows of diamonds – 124 of them to be exact, replacing the traditional tachymeter bezel on the 18k white gold case. While this watch doesn’t lack in glam, it’s not nearly as flashy as more modern versions like the Rainbow Daytona, which feels much more red-carpet (or Super Bowl halftime show) than cocktail hour. This Daytona has been placed on a black leather band which also tones down the glimmering bezel, striking Daytona dial, and glitzy white gold case. Set with 96 baguette-cut diamonds, the Classique 5238 certainly falls into the icy watches category; however it manages to maintain a classy sophisticated appearance (Image: Breguet). If you’re going to go for bling, you might as well go big. This Breguet Classique 5238 just screams opulence – the bezel, lugs, and 40mm white gold case are paved with a whopping 96 baguette-cut diamonds. If that’s not enough intricacy for you, the dial and movement have been skeletonized, and the delicately-shaped hands have been given a blue finish for a lovely contrast as they swing around the dial. While totally iced out, this watch feels completely sophisticated. The black leather band also helps keep it grounded, whereas something in matching white gold or equally blinged out might make it feel over the top (if you believe in that sort of thing). If you’re searching for something icy but elegant, you really don’t need to look any further. 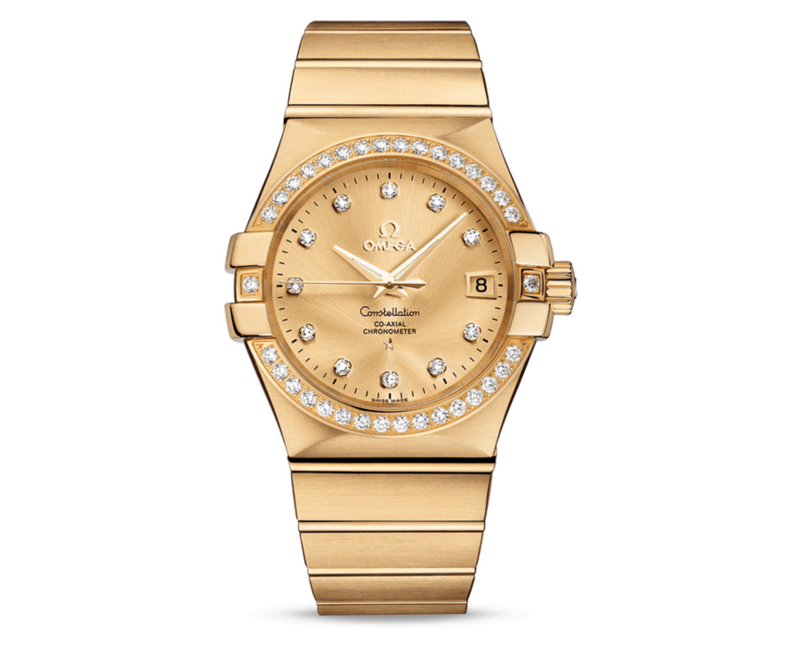 The Constellation is an icon and this particular model ups the ante with a diamond-set dial and bezel (Image: Omega). They say you can spot an Omega Constellation from across the room – put that to the test with this stellar yellow gold, diamond-clad reference. As if the 18k yellow gold case and matching bracelet with a champagne dial wasn’t enough, Omega decided to up the ante with diamond hour markers and a diamond-set bezel – we counted 45 diamonds in total. 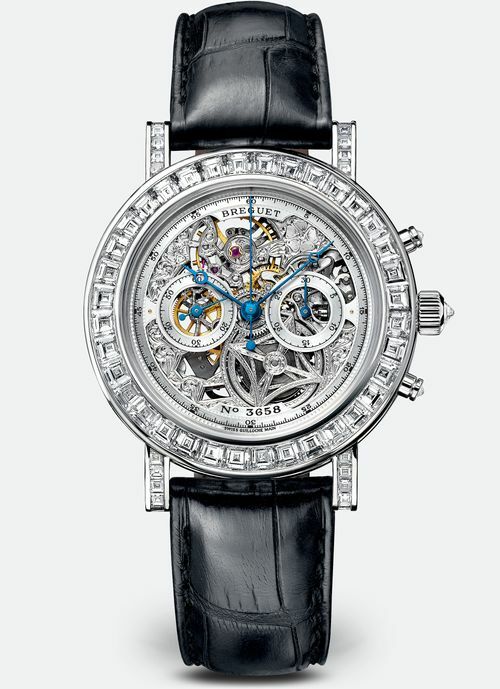 This timepiece is far from understated, but the relatively low diamond count compared to the others on this list does keep it from feeling like one of those ultra-blinged-out, celebrity-only icy watches. With that being said, it is a Constellation after all, and this watch is going to go far from unnoticed. After you’re done showing off that killer bezel, be sure to turn it over and show off the sapphire crystal caseback and Co-Axial Caliber 2500 movement . While the bezel features 40 brilliant-cut diamonds, this Royal Oak isn’t too icy to be worn with every outfit (Image: Audemars Piguet). Pink gold has never looked so good. There, I said it. This sporty timepiece molded out of 18k rose gold left me in a puddle – totally gushing over the famous rounded-edge octagonal case and 40 brilliant-cut diamonds set in the bezel. I also can’t get enough of that handsome, grey nickel-toned dial with AP’s signature, Grande Tapisserie pattern, which brings back that sporty and modern feel to this otherwise fancy watch. This is the kind of watch that you’re going to want to work into every outfit, and I don’t blame you. It helps that while striking, it isn’t so icy that you automatically freeze out every option. The beautiful pink gold also warms up the look and really helps differentiate it from the typical diamond-clad icy watches that have flooded the market.